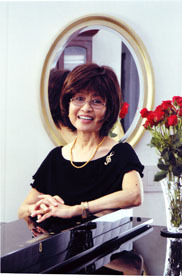 Ms. Lucy Lin initially studied under Anita Lee and Shiou-Ling Tseng in Taiwan; she continued training with Hara Nobuko and Takiko Okabe at the Tokyo University of Arts in Japan before going to Rome, where she studied voice with Maria Pediconi and Francesca Esposito and minored in piano at the Conservatorio di Santa Cecilia. Afterward she received post-graduate performance training at the Royal College of Music in London. Ms. Lin sang with the Glyndebourne Opera in England and performed concerts in Taiwan, Japan, England, Switzerland and South Africa during her 14 years in Europe. After moving to the United States in 1977, Ms. Lin studied with Mr. James Schwabacher, director of the Merola Program of the San Francisco Opera, and she received opera and Broadway musical training under June Montague, the founder of the Marin Opera Society in California. While in San Francisco, Ms. Lin performed in musical productions and gave solo concerts in support of the arts. Ms. Lin conducts vocal coaching in Mandarin, Taiwanese, Japanese, Italian and English, holds master classes and choral vocal coaching sessions, and has produced many musical events in San Francisco, Guam and Maui. Ms. Lin established A Touch of Opera Studio in 1984 in San Francisco, 1994 in Guam, 2004 in Maui, 2007 in Portland, and 2008 in La Jolla. In 1999, the government of Guam awarded her the Maga Lahi award in Performing Arts, nominated her for the National Medal Award for the Arts in 2000, and in 2001 also honored her with its highest award, induction into the Ancient Order of Chamorri, in recognition of her service on the Guam Council on the Arts and Humanities. In 2009 Ms. Lin accepted a position as musical director of the San Diego Chinese Choral Society after being elected by unanimous vote. Her goal is to expand the horizons of the Society and help it assume a greater role in the community. 林秋美女士初在臺灣先從師於李義珍(Anita Lee)後於鄭秀玲(Shiou-Ling Tseng), 16歲赴日本考進東京藝術大學(Tokyo University of Arts)繼續向原野子(Hara Nobuko)和岡多喜子(Takiko Okabe)學習聲樂.20歲赴意大利羅馬 Santa Cecilia音樂學院繼續深造, 獲Maria Pediconi和Francesca Esposito悉心教導下,學習Bel Canto美聲唱法,並輔修鋼琴. 而在卒業後前往英國倫敦皇家音樂學院(Royal College of Music)專修歌劇表演訓練的唱法. 1977年來美定居舊金山後,曾向San Francisco Opera專責Merola Program的James Schwabacher先生請益, 又跟加州The Marin Opera Society in California的June Montague女士學習歌劇與百老匯舞台演出的訓練. 林女士在San Francisco居住的期間曾演出”The Sound of Music”舞台劇,並經常為文藝活動,籌款活動貢獻而登台演出. 2000年代表關島被提名參加華盛頓每年一度的National Medal Awards for the Arts總統獎. 2001年 由於她對社區的服務及貢獻,被關島Guam Council on the Arts and Humanities頒發The Ancient Order of Chamorri的榮譽獎. 林秋美在關島期間,每週在電台主持一個名為”The Beautiful World of Classical Music” 的電台節目. 林秋美教室(A Touch of Opera Studio)首創于1984年的舊金山,除了美聲教學外,還做音樂表演的籌劃,合唱聲樂教導及指揮,曾多次主辦學生演出及大合唱音樂會.